Korean Air SKYPASS isn’t usually the first frequent flyer program that comes to mind when you’re planning to transfer flexible points to book award flights. But did you know you can get great deals using Korean Air miles to places like Italy, South Africa, and Hawaii on partner airlines like Delta, KLM, and Alaska Airlines? Or spots in Asia beyond Korea, like Japan, Hong Kong, and the Philippines? Many folks have access to Korean Air miles without realizing it! That’s because you can transfer Chase Ultimate Rewards points and Starwood points to Korean Air at a 1:1 ratio. 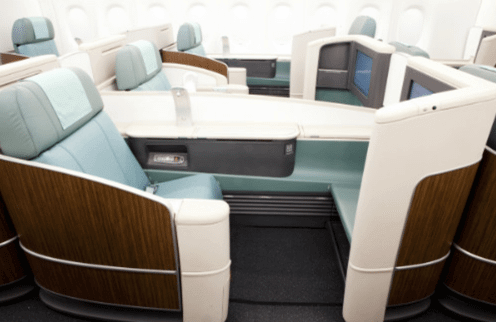 And Korean Air makes lots of award seats available – even in First Class. Their award charts include a few sweet spots that make redeeming Korean Air miles a tremendous value. But it’s not always easy to redeem Korean Air miles, and the process might seem intimidating if you’re not familiar with it. In this series, I’ll share tips and tricks for earning and redeeming Korean Air miles for Big Travel! What Can You Do With Korean Air Miles? And of course, you can use Korean Air miles for award seats on Korean Air! Keep in mind, your journey doesn’t have to end in Seoul if you fly Korean Air. You can connect onward to other Korean Air destinations in Asia and beyond, like Tokyo, Beijing, Shanghai, and Bangkok! The remarkable thing about Korean Air’s frequent flyer program is the number of award seats they release in all classes of service. Available award seats on Korean Air are plentiful both last-minute and in advance. It’s usually easy to find 9 award seats in coach on a single flight. And in Business Class, it’s common to find 4 or more seats. What makes Korean Air extra special is how (relatively) easy it is to book First Class award seats. Because there are few frequent flyer programs that are allowed to book Korean Air First Class, almost every flight that has a First Class cabin will have available award seats. You can often find 4 First Class award seats on a single flight! And even better, you’re allowed to book First Class seats on several partner airlines, like China Eastern, China Southern, and Saudia. You can even book Emirates First Class, which gives you an in-flight shower on their Airbus A380 planes! Note: You can NOT redeem Korean Air miles to fly Air France La Première (First Class), which is reserved for Air France’s Flying Blue frequent flyer members. Korean Air Offers a Slick and Comfortable First Class Seat, With Some of the Best Food in the Sky! To compare, Delta is also a SkyTeam alliance member. But they do NOT allow you to book First Class seats with Delta miles. Their call center is NOT always easy to work with. Fortunately, Korean Air now allows online award bookings for many partner airlines, in addition to their own flights. Award bookings that involve flights operated by a partner airline can only be booked as a round-trip or multi-city ticket. If your flights are only on Korean Air, you can book it as a one-way ticket. You can hold award seats for 30 days! Change fees are low – just 30,000 South Korean Won (~$27). 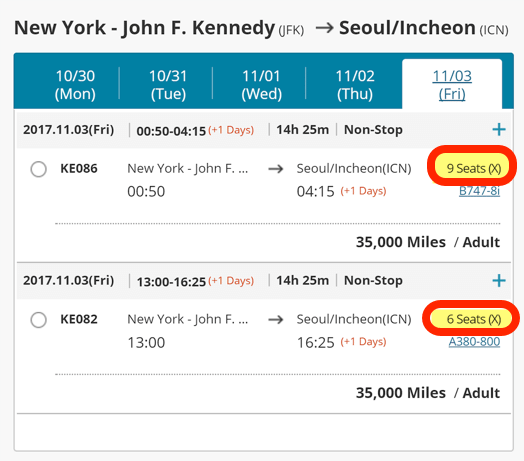 Korean Air adds fuel surcharges on award tickets, but Korean Air flights have low or no fuel surcharges. 2. How Many Korean Air Miles Do You Need? 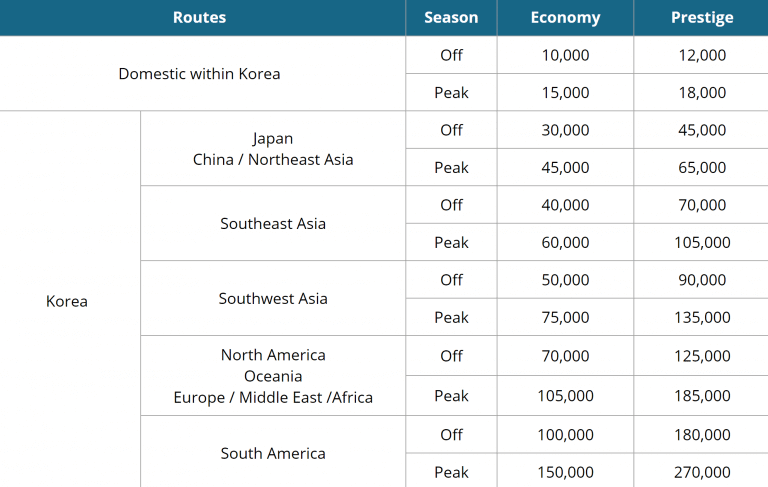 Note that Korean Air has off-peak and on-peak dates. On-peak is during normal high season dates, and off-peak is everything else. 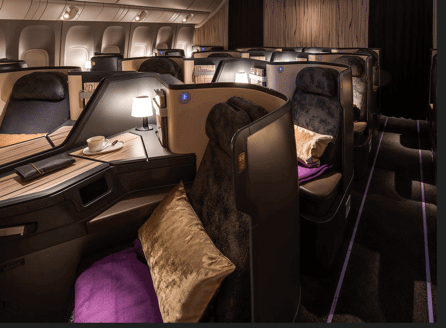 They also have award redemption sweet spots, such as 120,000 Korean Air miles from North America to Africa round-trip in Business Class on partner Delta! In comparison, Delta charges 160,000 Delta miles round-trip for the exact same flight. In future posts, I’ll share strategies for booking and even more sweet spots to help you make the most of Korean Air miles! Want More Korean Air Miles? Korean Air miles are easy to earn! You can also transfer Starwood points to Korean Air at a 1:1 ratio. And for every 20,000 Starwood points you transfer, you’ll get an additional 5,000 Korean Air miles as a bonus! You can also transfer Marriott points to Starwood at a 3:1 ratio, which means that you can get Marriott credit cards and convert your points into Starwood points. Then move Starwood points to Korean Air. You can earn Korean Air miles by flying Korean Air or their partners. Or from the SKYPASS Visa® Signature Credit Card by US Bank, which gives you 15,000 Korean Air miles after your first purchase and payment of the annual fee. But I do NOT recommend this card for most folks, especially if you’re new to miles and points. Booking award flights with Korean Air miles can be an excellent deal, especially because they release so many award seats in all cabins. You can also use Korean Air miles to book award flights on SkyTeam alliance and other partners, like Delta and Alaska Airlines. Korean Air miles are easy to earn, because you can transfer flexible points from Chase Ultimate Rewards and Starwood to Korean Air. While rewarding, Korean Air’s SKYPASS frequent flyer program has its quirks! 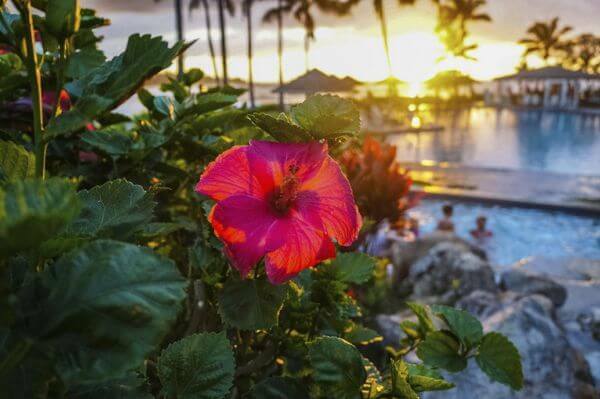 But I’ll explain how to use your miles step-by-step in this series, and share the program’s best sweet spots and booking strategies. Stay tuned! Great article! I had a quick question about adding family members online. I want to add my wife and newborn twins. It asks for a Family SKYPASS Number, do I have to register each member first and use that or is this number something that we make up on our own? What should we enter into that field? Thanks for your help! I had to enroll each family member to first obtain a SKYPASS number. Using the individual numbers, I was then able to add them as family members to my account. It may sound tedious, but once it’s over, you’ll never have to do it again. Korean airlines’ frequent flyer program is awesome for redemptions (particularly for family travel). Good luck! Yep. They will need to both be registered separately. This should be easy to do as soon as you get the birth certificates. If you do plan to travel with your twins, you must let Korean Air know that you will be taking them on the trip (as with most airlines)–please don’t make the potentially costly mistake of just showing up with the babies to the gate. As long as they are “lap infants,” the cost for their tickets will be 10% of the normal award miles. There are limited numbers of baskinets available in economy and business class sections on most long-haul planes–these will be very useful (particularly with twins). If you would like to purchase a full seat for them instead, it will cost the “normal” number of miles. I hope this helps. BTW, I’m in no way affiliated with Korean Air–I just love their program. Good luck! Can you fly from the US to South Africa on Korean Air, or do you have to fly one of their partners? If a partner must be flown, do you still get the excellent award availability? The reason I’m asking is because it sounds good in theory that you could use less miles on Korean to fly Delta to South Africa, but in reality Delta doesn’t release low level award space on that route. Thanks! Great question! Korean Air doesn’t fly to South Africa, so you would have to fly with a partner airline. As you said, Delta does not release a lot of award seats on their flight to Johannesburg. Instead, consider KLM or Air France (also SkyTeam partners) which tend to have more available award seats to South Africa via Amsterdam or Paris. Hope this helps! Is it possible to cancel a reward ticket and get back chase reward miles? While you can cancel/refund an award ticket and get back your Korean Air miles, once you’ve transferred Chase Ultimate Rewards points to any partner, you can’t move them back. So any refund for cancelling a ticket would come in the form of Korean Air miles. Any idea how many miles are required to fly business or first class on Korean Air from US to New Zealand/Australia, or if it’s even possible?? Absolutely! Korean Air flies to Auckland, Brisbane, and Sydney. It’s important to note that not all Korean Air flights have a First Class – it will depend on the route and schedule. You can fly round-trip from the US to “Oceania” (Australia and New Zealand) on Korean Air for 110,000 miles in coach, 195,000 miles in Business Class, and 240,000 miles in First Class. This isn’t the best use of Korean Air miles, though. Other airlines, like United Airlines, charge fewer miles to get to Australia and New Zealand.